What grapes can you grow? The challenge faced in growing grapes outdoors north of the southern counties of England is being able to ripen the grapes. Virtually any type of grape will grow in a warm greenhouse. Dessert grapes need to be grown in a warm greenhouse unless there is a particularly hot and sheltered spot in your garden. The Victorians (and many modern gardeners) advise planting the root of the vine outside the greenhouse. The best-flavoured dessert grapes are the Muscats though they can be troublesome. Black Hamburgh is often recommended but many find it lacking in flavour. Alicante is a less frequently cited grape and has a good flavour but needs to be kept warm. MADELEINE ANGEVINE is French but has gained popularity in the Marches. Ripens early and is a good cropper. SEYVAL BLANC is also French, a hybrid variety that is known as ‘Save all’ as it invariably crops when others fail. PHOENIX is a popular grape. It is supposed to be disease-resistant, but still needs the occasional anti-mildew spray (e.g. liquid sulphur). BACCHUS is less mildew resistant, but is widely grown in England. It is known as the ‘Sauvignon Blanc’ of England as it produces a fresh and slightly spicy wine. SIEGERREBE is not the easiest grape to handle but when mixed with other varieties can add a Muscat flavour to the wine. Wasps love it! Red grapes: RONDO and REGENT are popular and produce good, deep-coloured wines. LEON MILLOT is also a very reliable grape, producing a large amount of small berries. It requires no spraying. Most commercial varieties will be grafted onto rootstock. SO4 is very popular. This is because of the risk of Phylloxera. This aphid-like creature is a sap-sucker which destroys the root systems of vines so a resistant rootstock is essential. Any grapes grown outdoors need to be in a reasonably sheltered location, a back garden can work well. Growing against a south-facing house wall is ideal, since they will bud and ripen earlier with the extra heat reflected from the wall. Such vines are best spur-trained. This involves creating about two main stems. Any side stems are trained to about 3-4 buds each winter. Vines will not thrive on water-logged soil - they do not like clay. 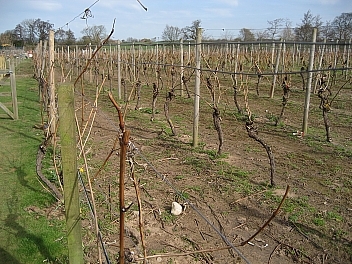 Vines grown in the open ground need training wires on posts (rather like cordon fruit trees.) Wires should run in a north-south direction to ensure maximum exposure to sun. Put in 2 posts and put in wires at about 2 foot intervals, starting about 2 feet from the ground. Plant the vines at about 4 foot intervals. For the first and second years, just allow one main stem to grow. During winter, cut the stem down from the tip until you see green wood. During the 2nd year, allow a few more stems. After the 2nd year, select the two strongest stems and bend them down along the bottom wire, tying them firmly down. Cut back to green wood, or 8 buds, whichever is the least. Leave one other shoot in case of failure, but cut back the others. This is called Double Guyot training. The grapes will grow from the 2 stems, and new stems should break at regular intervals. If fruit is abundant, it may be necessary to thin the bunches particularly with dessert grapes. Nail scissors and patience are effective. Remove any leaves shading ripening fruit. Established vines in open ground should not need watering. Until recently birds were not a major problem with white grapes growing in open ground. However this is changing and the new source of food has been identified. Netting can be expensive and can trap and harm birds. Revolving CDs (on thread) can be effective against some birds but don't put them up until needed or the birds become used to them. Check your soil and local climate. Decide what you want of your vines. Check varieties against your growing conditions. For further information: The UK Vines website covering UK vines includes information about growing vines in Northern England and Wales - the Mercian region.